An awesome fashion creation from brand Rainkids will add an elegant touch to the ceremony. 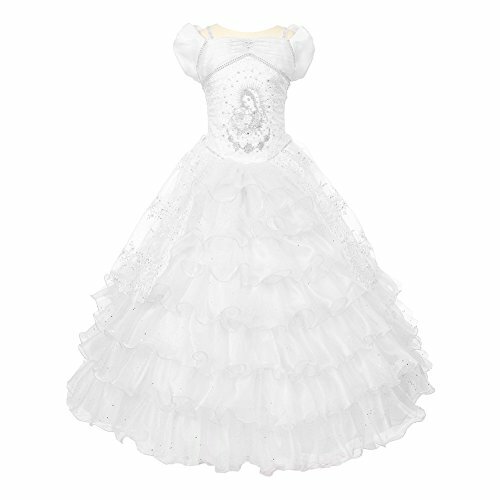 Off shoulder - short sleeves First Communion dress with beautiful detail on the sleeves and shoulder. Top of the dress has embroidery of Virgin Mary and the Pope. Skirt has a beautiful embroidered organza material which opens up on the front center and fill with layers of sparkly tulle and ruffle organza (2 fabrics on each layer). Corset on the sides to adjust for size. True to size. Made in USA. If you have any questions about this product by The Rain Kids, contact us by completing and submitting the form below. If you are looking for a specif part number, please include it with your message.